All images copyright © 2015 by Wm. Robert Johnston, unless otherwise indicated. 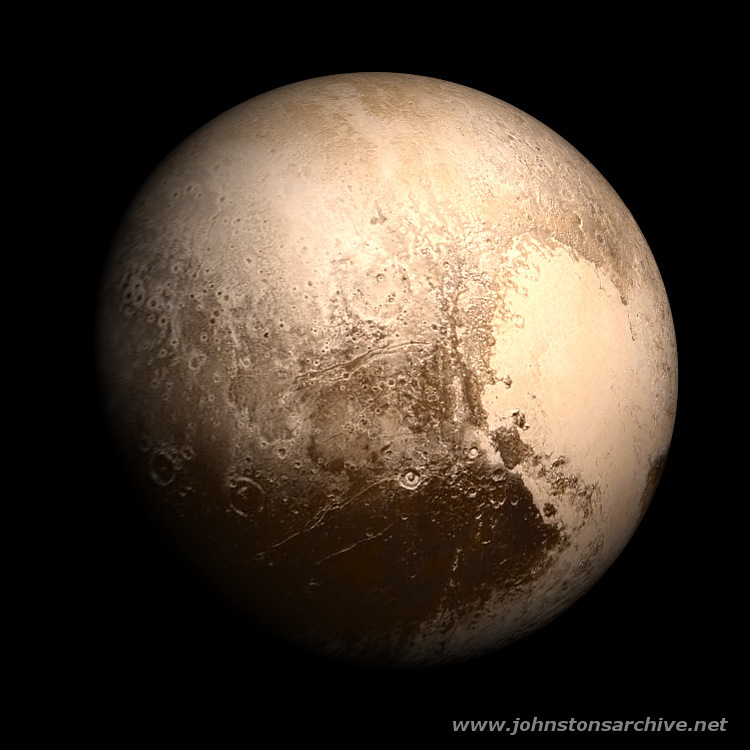 The above view is a 2 degree field of view looking at Pluto from 100,000 km away. 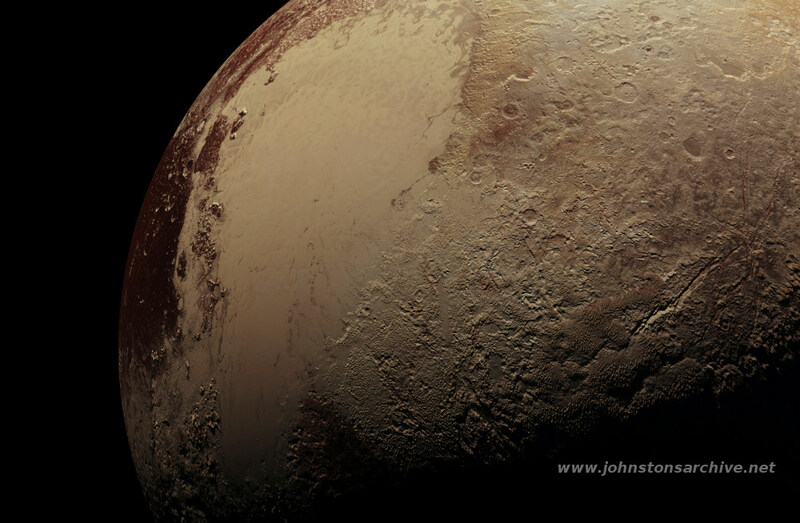 The heart-shaped Tombaugh Regio (unofficial) is visible on Pluto. Behind Pluto is its largest moon Charon, with its dark polar region Mordor (unofficial) just visible at the top. Pluto's four smaller moons with their wide range of albedos are also seen: from left to right, Styx, Nix, Kerberos, and Hydra. The Pluto and Charon maps are both from this artist (who did a great job with them); Nix is represented by a modified version of an Amalthea shape model. This view from 5,700 km above Pluto shows the variety of surface terrains, including: dark, older cratered surfaces along the equator; the fresh glacial flows of the heart-shaped region at the right; and the slightly dark north polar region at the top. 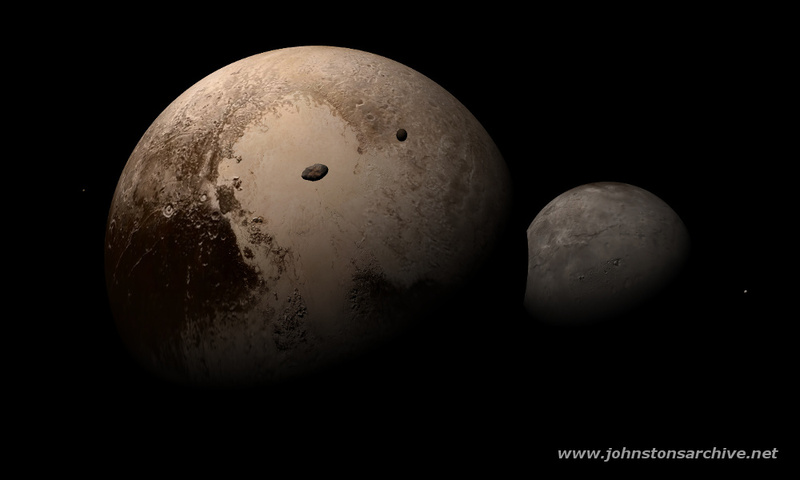 This is a reprojection of images released by the New Horizons team on 24 July 2015. This view from 2,000 km above Pluto shows the bright ice flows of the Tombaugh Regio (unofficial) in the upper center and the unusual terrain to the northeast, the "snake-skin" terrain and scarps in the lower right. This is a reprojection with color adjustment of images released by the New Horizons team in October 2015. Copyright © 2015 by Wm. Robert Johnston. All rights reserved. Last modified 17 October 2015.